Three original designs for snowflakes by yours truly, are included in 2 PDF files along with a template for starching and shaping them. Make them into earrings, garlands, holiday ornaments, cards, scrapbook pages . . . let your imagination go wild! The only stitches you need to know to create these beautiful snowflakes are the chain stitch, slit stitch, single crochet, double crochet, and treble crochet. Add a little of the oh so very fine Martha Stewart glitter, and you have the prettiest sparkling snowflakes ever! 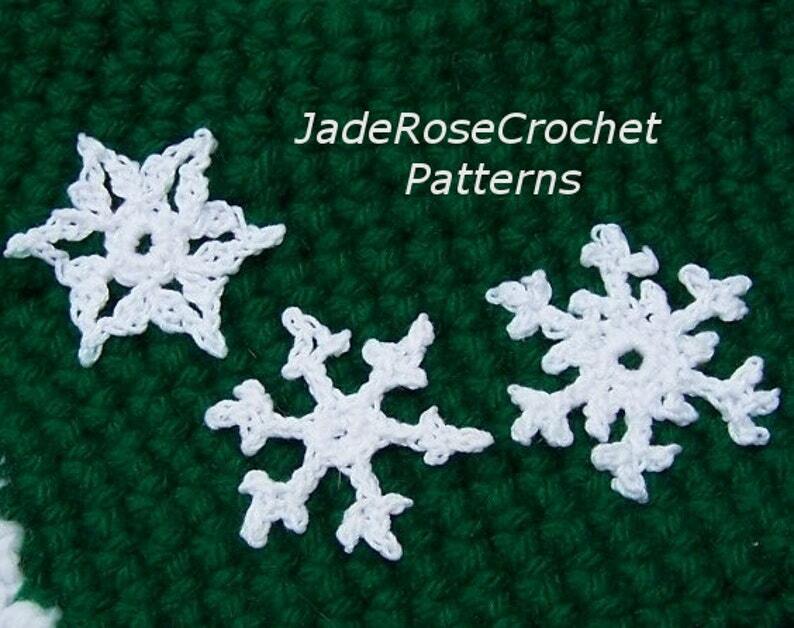 Sizes: PDF 700 is for 3 snowflakes, each 2.5 inches(6.4 cm) in diameter. Crochet Cotton 3 or 10. "good communication, great patterns - thanks!" "I have made six of them and the instructions are very easy to follow and they look great!" Love the pattern but don't crochet? Contact me for a custom listing. Amazing detail & pics! May take me a while since I’m learning crochet, but this pattern gives me a great easy to follow challenge!